Whew, that is a long name for a small, delicate cookie, but I wanted to get all the goods in the title. Here's the story- I have three kinds of desserts stacked in the freezer for Dave to snack on (pumpkin magic bars, biscotti and semifreddo), but he just plain prefers a cookie and isn't touching any of the other treats. So Dave needs cookies but I'm on a detox from all dairy (even butter!) so creativity is a must. 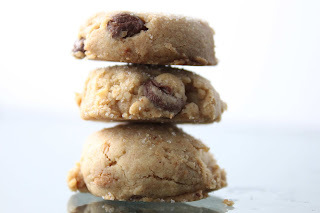 Using homemade nut butter as the base, left over from the Adult PB&J's last week, these are a version of my shortbread recipe with the addition of nut butter and both chocolate and peanut butter chips. Oh- and did I mention the use of olive oil in place of the butter? Genius. The result? A delicate, crumbly, melt-in-your-mouth, creamy, nutty, chocolaty experience. They even melt on your fingers for just a moment as you raise it to your lips. For some reason these remind me of a grandma cookie so I took a few photos of them assembled in Grandma's sugar jar- just seemed fitting. On that note, I think I'll go call her and let her know how fat and happy we are. 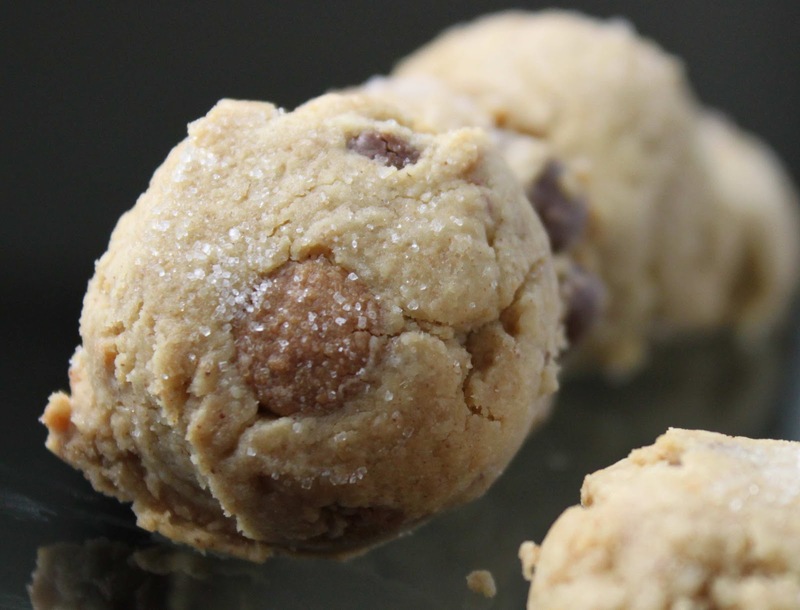 You should do the same... right after you make these scrumptious cookies and put them in the freezer for your sweetie. Tips and Techniques: You can use store bought almond butter or peanut butter, they are going to be slightly stiffer than my homemade nut butter; if the dough is too stiff and crumbly, adding in an extra tablespoon of olive oil should help. 5 Tbls creamy peanut butter or home made nut butter (recipe for nut butter is below and at the Roasted Nut Butter sandwich posting here. Add the flour, powder sugar and salt to mixing bowl, stir to combine. Mix in the olive oil, peanut butter and vanilla, use an electric mixer if needed. Add the chips last. Scoop 1 tablespoon of dough onto the sheet; slightly smash with a small glass dipped in sugar. Bake on parchment paper lined cookies sheet for about 10 minutes at 400 degrees. Allow the cookies to cool for about 5 minutes on the cookie sheet before moving to a cooling rack. This makes a nice small batch of cookies, about 30 using my smallest cookie scoop (#100); this scoop is slightly smaller than 1 tablespoon. Spread the nuts on a baking sheet and place in the oven just until the nuts begin to brown, 5-6 minutes, watch them closely as they will burn in a blink of the eye. Remove and set aside to cool slightly.